Play the ukulele because it's a lot of fun and with just a little practice, it's fairly easy to get some nice results! Especially if you play the guitar already, you'll pick up the "uke" in no time. Developed in Hawai-i, this 4-string instrument looks and works a lot like an acoustic guitar, except that its body is a lot smaller and lighter. Due to the smaller size, the uke sound is less full than that of a guitar. Nevertheless, the uke is an excellent instrument particularly for accompanying singers. We're very pleased to offer private Ukulele Lessons in Flemington and Lebanon. Lessons are available in 30, 45, and 60-minute formats. To get started, call us at (908) 782-4943, or fill out the form on this page! 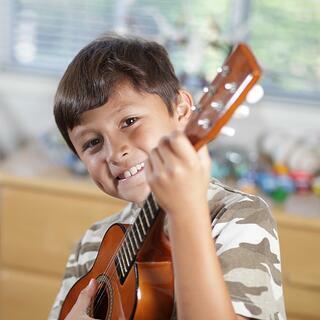 Schedule Your First Ukulele Lesson Today!